So today we've been left to deal with the aftermath of Reagan's dental work. Things seemed to go so smoothly yesterday. Even last night, she somehow managed to sleep through the night (with the occasional waking up and fussing but each time she fell back to sleep on her own). But today has not gone so smoothly. Reagan woke up this morning in an OK mood. She wasn't feeling great, but she wasn't crying either. Then as the day went on, she got more and more upset. Lots of crying...the inconsolable type crying. You could tell she was tired...she'd yawn again and again...and she even fell asleep multiple times, but the second we'd try to lay her down, she'd wake up screaming. Her mouth is definitely bothering her. She's grabbing at it, moving her tongue all around, she's having some serious pain. And the thing is...there was not supposed to be any pain with this procedure! Hopefully it's just a little post-dental work pain that Reagan is hypersensitive to and not something more serious like one of the caps hitting a nerve. Please pray for Reagan to recover from this and get back to her happy self. I can't stand the idea of them having to go back in to fix something that should have been done right to begin with. She so needs some sleep tonight. We were so desperate to soothe her that we gave her clonopine at 6:45pm and it did NOTHING. Well it did make her settle down for a few minutes, but it did not help her to fall asleep and stay there. We actually spent most of the night trying to put her to bed. She'd cry a lot, then finally fall asleep on us, we'd tippy toe into her room and lay her down...POW wide awake and crying. So frustrating. Finally Mike just laid in bed with her and that's where they are now. I'm guessing he's going to try to get up and into his own bed...that probably won't go over well. Please say some prayers for our little one. She really needs them! 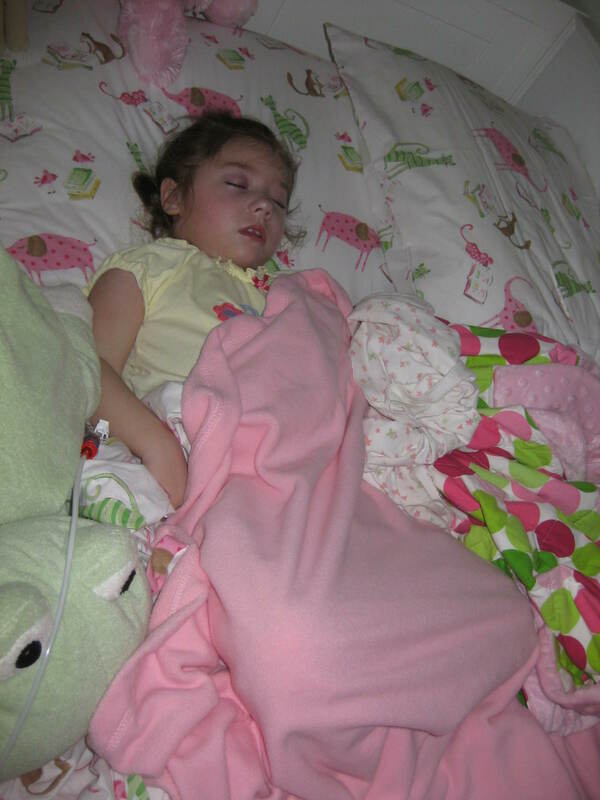 Reagan slept well last night, waking up at 7am when we loaded her into the car to head to the hospital. We spoke to anesthesia and they informed us that she was not just going to get light iv sedation, they were going to do general anesthesia and they were going to intubate her (up the nose)...all news to us. Reagan was a good girl as we waited...they took her back a whole 2.5hrs after we got there. Once she was back, everything moved quickly. They came and got us about 45min later to go to recovery. The doctor told us that he only had to do 2 caps and 2 fillings! I was pleasantly surprised to hear that! They also cleaned the tartar off her other teeth. So for now, all looks good. Reagan was crying when we got there. She had blood on her lips and in her mouth and also up her nose. I hooked her back up to her pump full of pear juice, gave her some tylenol and then picked her up. She fell asleep in my arms...and there she slept. We kept telling the nurse that she always does this but she wasn't having it. She made us try to wake her up. Bad idea. The screaming started and so did the breath holding. Now the nurse was super nervous because her sats dropped into the low 40s (I've seen them go to the 30s before when she's holding her breath). We kept telling her that she always does this when she's in pain. She had to call the anesthesiologist who said that he wasn't worried about it because he didn't give her any narcotics and that we could just go home. Then they came and took her iv out. That woke her up! Then the crying started. She cried all the way home and for hours afterward. Her eyes were so puffy and swollen, she could barely open them! She'd try to yawn but she'd only get her mouth half open and then she'd start crying. So pathetic. You know she's tired but she just can't get to sleep. Poor thing. She kept grabbing at her mouth as if to tell us that's what was hurting her. Finally this afternoon she settled down. We even saw a few smiles. This girl is such a trouper. She's been through so much and somehow manages to keep a smile on her face. Thank you all for your prayers and keep them coming for a quick recovery! Reagan miraculously slept through the night last night. No clonidine. She fell asleep at 8:30pm and slept til 7am this morning. This is completely unheard of...but oh so great! I still woke up every so often to make sure she was still sleeping. She's been in a fairly mellow mood today. Not a ton of smiles, but content. She had OT this morning and I was amazed at how well she was doing on her tummy. She was up on her elbows, but really picking her head up high. Something I didn't expect to see in her mellow mood. Then she had Feeding therapy and she ate some cinnamon applesauce and a few bites of graham cracker. She was a little spitty, so that was a bit of a challenge, but she still did a good job. We were actually supposed to have another appt afterward but Reagan was looking sleepy and I thought we had done enough for a day. Tomorrow is her dental procedure at Texas Children's. They're supposed to do x-rays of her teeth, put caps on all of her molars (8+), and hopefully clean her other teeth. We have to be there by 8am. She can't have formula after midnight, but she can have clear liquids til 7am. So I'm going to give her diluted pear juice until then, that way she doesn't go without anything for too long. Please say some extra prayers for her. I've heard this procedure shouldn't cause pain, but as everyone knows you rarely ever leave a dentist's office without some pain (even with a cleaning). 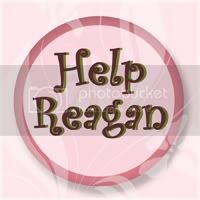 Reagan's not good with pain, so pray for no pain. No problems with anesthesia. No complications whatsoever...for everything to go super smooth! Thank you!!! Reagan kept rolling onto her side tonight...I think so she could lick her hands/arm. Look at the size of that mosquito bite! Love the gulf coast. Last night didn't go exactly as planned. Reagan woke up just as I had settled into bed. She threw up twice...not fun. Then she was wide awake. I went ahead and gave her clonidine and 20min later she was out for the night. It's great that the clonidine is helping her to sleep but I do feel guilty about giving her something. I wish she would just sleep without medication. Tonight she fell asleep at 8:30pm but I'm guessing that won't last too long. This girl rarely goes to bed that early. After yesterday's nausea and vomiting I decided I had to get her back on the periactin (I tried stopping it yesterday because she was down to only 2 wet diapers in a day). So the first thing I did this morning was give her periactin. She was very spitty and gaggy at times, but she never threw up today. Thank goodness. She seemed to be feeling a little better too. Definitely more relaxed and easy going. She did have a big giant dirty diaper, so I'm sure that helped. Hopefully she's feeling well tomorrow...we've got a long day planned. Then Tuesday is the day for her dental work...I'm still nervous about that. Please continue to keep her in your prayers! So last night I tried to forgo the clonidine but Reagan was not having it. I put her in bed hoping she would just fall asleep but it never happened. Finally I decided to just give her the clonidine. She woke fussing at 2:30am due to a huge dirty/wet diaper. I didn't mind...we had been waiting for both. Lately the fruiteze just does not seem to be cutting it and the periactin we gave her for nausea (which worked like a charm) also makes her withhold her urine. Thankfully she went right back to sleep and slept through til 8am (when the nurse rang the doorbell and the dog barked and woke her up). She was a good girl most of the day. She was well behaved for the nurse and I was able to get some much needed house work done. She just wasn't the happy sweet girl we're used to. She was tense...and easily startled. Then this afternoon things got worse. She started doing this weird squealing thing, at first we thought it was a happy squeal, but it wasn't. It was more like she was in pain. She did this for a while. At first I thought it was tummy related but now I'm thining it was more of a neurologic quirk. We also noticed her doing a few of the head twitches and she was even acting a little gaggy (and kept sticking her tongue out). It was all very strange. Finally she calmed down a little with me holding her and then eventually settled down altogether. She was still tense tonight when she fell asleep in my arms (without clonidine), so I sure hope she's able to sleep tonight. I don't know if she's coming down with something or what. Please keep her in your prayers! Reagan was a turkey last night. No sleep whatsoever. She was good, she just laid there in her bed moving around and making the occasional noise, but no sleep. Finally around 6am I put her in our bed. She was very restless, her arms kept flying up in the air, but finally she started settling down. By 7am she was finally fast asleep. Poor thing. I just don't know how she does it. Up all day long (a busy day at that), not even the slightest nap, and then up all night long!?!? It's crazy! She slept from 7am this morning til 3pm this afternoon (and that's with us finally waking her up)! At least she did finally get some sleep...although this doesn't bode well for sleep tonight. She slept through vision therapy (for the second week in a row) but we did wake her up at 3 and take her in to the pediatrician's office. She said Reagan's throat looks way better than last week but that her ears actually looked a little worse. She went ahead and gave her a shot of antibiotic (Rocephin) to clear up anything that might be brewing and she gave the OK for dental work next week. I was really hoping she'd want to wait but she said she thinks as long as Reagan stays healthy between now and then (Tuesday), she'll be good to go. I know it needs to be done (we've already put it off twice) but I'm definitely not looking forward to it. Lots of prayers needed in that area. Reagan has been such a doll today. For starters, she woke with a smile on her face (which normally does NOT happen). During her appt she was really hamming it up for the pediatrician, huge smiles and laughs...I don't know if the pediatrician has ever seen her so engaging. She's such a little turkey. She's driving me crazy with those hands. She's got them up in her face at all times. Feeling her face, licking her hands, licking her arms...everything smells like spit! Not to mention she's clawing at her neck and arms with those little fingernails! I'm constantly worried that she's going to bite one of her fingers again. Oh that did not go well. Hopefully we can all get some sleep tonight. I'm seriously thinking about giving the neurontin a try. We've just GOT to find something to help her sleep! Reagan had another good night again last night, she woke up at 5am but then she eventually fell back to sleep in our bed. She's been super sweet and happy all day today. She's grasping her hands a lot and bringing them up to her face, where she either licks her hands or her arms. As long as she doesn't bite them! She's also been doing lots of quiet babbling in this sweet little voice...so cute! Mike's parents came by and finally got a glimpse of her in a good mood. Usually when they see her she's either sleeping or crying. 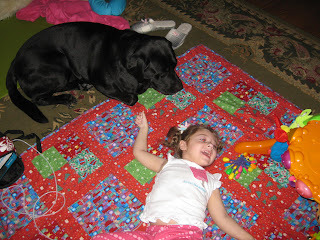 Reagan had a busy day today, OT and feeding therapy back to back. She was finally awake (and not gaggy) for feeding therapy, so this time there was some actual "feeding" taking place. She had some of her therapists veggie/fruit smoothie. She even drank it out of a cup! Then a few bites of a veggie stick and some applesauce to wash it down. Of course she only had small amounts of all of these but she seemed to do well with it. That is, until her therapist put the veggie stick in her hand. She burst into tears! Not sure what that was about but she got over it quick and went the rest of the day without any more meltdowns. She does seem to be feeling much better than last week, although she did have another low grade fever this afternoon. Her dental work (8+ caps, x-rays, cleaning all under anesthesia) is still scheduled for next week. I'm not sure if I really want to go through with it. Sounds like a lot of trauma for my little one. I wonder if this is something we absolutely positively need to do right now. I'm not sure what to do about this and need some guidance, prayers for guidance are appreciated. No naps today, so I'm hoping for a good night's sleep again tonight! Please continue to keep our sweet girl in your prayers. Reagan has been a sweetie again today. She slept through the night last night, although I did see her wake up multiple times, she never fussed and eventually went back to sleep on her own. She had a few groggy moments today, but every time I tried to lay her down she'd wake back up. She was pretty squirmy today. I would lay her on the floor with her toy, only to find her turned completely sideways minutes later. She's also been really talkative. She'll think really hard before she says something. You can see it on her face that she's trying to get something out. It's too funny. We had a very lazy Father's day here at home. We didn't go anywhere or do anything...just watched a lot of golf. Hope everyone had a good one...that includes my crazy dad who is biking the Lewis and Clark & Northern Tier Trails every day for two months straight! Last night was another good night's sleep. I'm loving it. We're all loving it. Even with all the sleep last night, Reagan was still a little groggy today. We gave her a bath this morning around 10:30am and she fell asleep before we could even get her dressed (I'll have to post those pics tomorrow). She slept for 3hrs straight and then took another little nap an hour or so later. Now that it's bedtime she's looking a little more alert. She's laying in her bed, making noises, squirming around, head back and forth. Go figure. When awake she's been super sweet and cuddly. She just lays on my lap, smiling up at me. What a sweetie! Her nausea has almost completely gone away...I don't know if that's because of the periactin I started her on or because she's just feeling a little better. Hopefully she's feeling better. Prayers for a healthy girl are definitely appreciated. 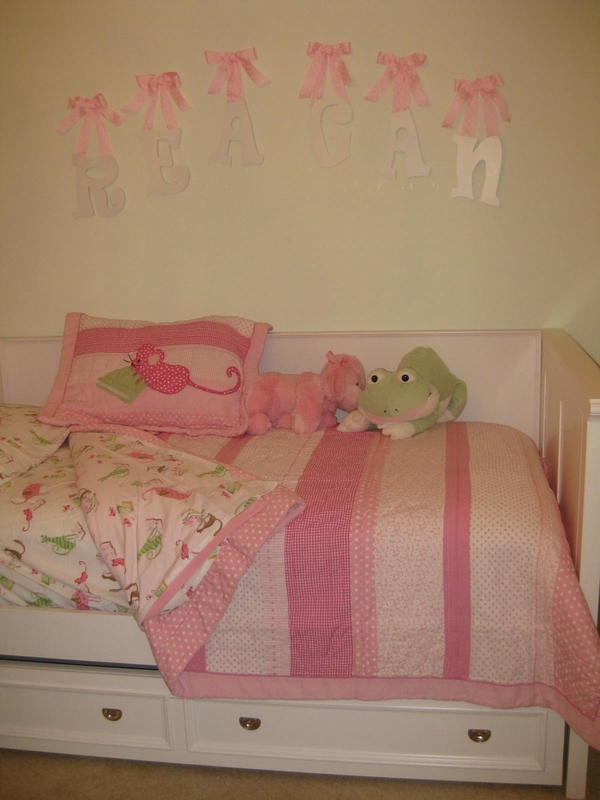 Reagan slept well last night. She only woke once (that I know of), around 4am, she moved around a lot and then fell back to sleep. Then this morning she woke and was smiling ear to ear when she saw her Grandma. Such a cutie. We've gotten lots of giggles out of her today. She took a little cat nap this morning and then fell asleep in the car on the way to OT. She was out cold. I was afraid she wouldn't wake up, but her OT has a way of getting her to come to. What's funny is that instead of being cranky, she woke smiling and laughing! I love seeing my girl happy. Overall she seemed to feel a little better today, but you can tell she's still not quite herself. She was also running a low grade fever all day today. Hopefully she'll get over this junk soon. We need our girl healthy! Please continue to keep her in your prayers. Last night was a dream. Reagan fell asleep at 7:45pm (ridiculously early for her) and then slept straight through the night til 8:30am! An answer to prayers, that's for sure. She woke a little fussy but got over it pretty quickly. She had PT this morning which went well except for her falling asleep at the end. Her therapist put her in her stander and within 5 min she was asleep. We left her in for about 30 min (so at least she could get a good stretch) and then transferred her to the floor. She was OUT. She slept for an hour and then we had to get her ready for feeding therapy. 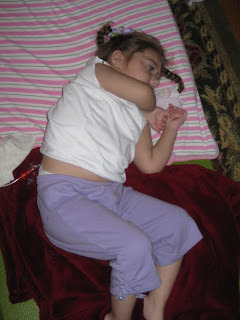 We changed her clothes and she woke up; we put her in the car and within 10min she was asleep again. She never woke during feeding therapy. Her therapist did some stretching with her but that was about it. We came home and she continued to sleep. She was out for almost 5hrs total during the day...definitely catching up on all of her lost sleep. We'll see what that means for tonight. Even after waking up she still seemed very groggy. She did get very excited when she saw Grandma though. Eventually the sleepiness wore off and she became more animated. She and Grandma spent some quality time together while Mommy and Daddy went out to dinner. Now we're all exhausted and she's not looking too sleepy. If only we could get her on a regular sleep schedule. I think first we have to get her healthy for that to happen. Please continue to keep her in your prayers. Last night was another rough night sleep-wise. I gave Reagan a nighttime dose of clonidine (3/4 pill) and waited. About 30 min later she was out. I put her to bed and then quickly tried to get to bed myself. Reagan woke up at midnight, only two hours after falling asleep, and she was wide awake. I left her in her bed but as far as I know she never went back to sleep. Around 5:30am I picked her up and put her in our bed where she just cooed and laughed, but no sleep. On a good note since she never fell asleep, she never had the opportunity to wake up screaming and crying. She's actually been in a pretty good mood all day today...even going on no sleep at all. This afternoon we took Reagan in to the pediatrician to get checked out. She was running a low grade temperature and still doing lots of movements and very gaggy. She had a little fluid in her ears but her throat was "raw". No strep but definitely a throat infection. We switched her from her usual prophylactic Amoxicillin over to Cephalexin, so hopefully that will clear it up. 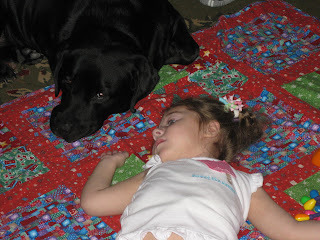 She also suggested we try some neurontin for sleep (which her neurologist called in on Monday). I'm not sure if we'll need it or not...around 7:45pm Reagan fell asleep in my arms and she's been sleeping ever since. I can't blame her, she has been up for over 36hrs straight, but I don't know if she'll actually sleep through the night. Please continue to keep her in your prayers...that she gets some much needed rest and that she starts feeling better soon. What a night. Last night Reagan was completely resistant to sleep. I don't know if she just wasn't tired or what (I didn't see even one yawn) but the chorea/constant movements probably had something to do with it. I put her in bed around 11:30pm and she just laid there moving around. Around 1am I woke to her "talking"...she obviously never went to sleep. I decided to pick her up and try her in our bed. Nothing. She was moving around, babbling, no one was getting any sleep. So I decided to get up and watch some tv with her. So from 1:30am-4:30am we watched the Real Housewives of New Jersey (quality tv, I know). She was wide awake and still very gaggy. She tried to throw up a few times but nothing much came up, it just stayed lodged there in her throat. I kept doing everything I could to get her to swallow it down but she continued to sound gurgly. Finally at 4:30am I put her back into her big girl bed and I crawled in beside her (afraid to leave her side that she might throw up again). She was still wide awake and moving around, hitting me in the face. I'm guessing sometime between 5-6 she finally fell asleep. I got up at 7 and moved back into my bed. Mommies are not allowed to sleep in too much, I have medicines to give, so around 8:45 I forced my exhausted self back out of bed and have been up ever since. Reagan was still fast asleep at noon so I decided to wake her. She woke just as upset and irate as yesterday. She was hysterical. Being nurseless again today, I was regretting my decision to wake her. I gave her another dose of clonidine and about 2hrs later she started to settle down. She was still doing lots of movements but at least she wasn't crying anymore. 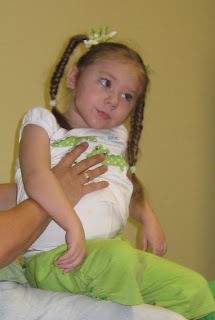 I spoke to the neurologist today and he thinks we should try to get her in to see the movement disorder specialist. He does agree that these movements seem to be brought on by illness. He also mentioned something called tetrabenazine. He thinks it might be our best bet to help her chorea...although I think we're waiting on the specialist before trying it. Tonight we may just try another dose of the clonidine, although it has never done much to help her sleep (none of the meds have). Tomorrow we're going to pay the pediatrician a visit, just to make sure we're not dealing with an ear ache or something that can be easily treated. Tonight she's still going strong. She's hard to hold with all the movements and constant extension. I really want to get some sleep tonight but I'm not holding my breath. Continued prayers are definitely appreciated. We're running on empty over here. Several nights in a row of only a few consecutive hours of sleep...we are seriously exhausted. Last night Reagan really threw us for a loop. After having a pretty good day, she turned on the crankies at night. I was up with her til after 1am just trying to calm her down. Finally she was calm enough to lay in bed and I fell asleep (not sure if she ever did). Around 3am we woke up to her coughing, we leapt out of bed to find her choking on her throw up. Ugh. Exactly the scenario I wanted to avoid. So at this point I had to put her in our bed so I could keep a close eye on her (good idea because she did it again). Finally she did fall asleep and slept in til 10:20am on my pillow. At least someone got some sleep...she didn't get much, but I'm glad that she got some. She woke with a vengeance though, screaming and crying for 2+hrs. Her nurse was really concerned because her heart rate was over 200. Tons of chorea. She couldn't hold still, she was moving nonstop (moving her legs like she was sprinting). After talking it over with the pediatrician's nurse, we gave clonidine a try (1/2 pill). About an hour and a half later she finally settled down. The rest of the day she was fairly content. Don't get me wrong, we were walking on eggshells with her, but no more outbursts. Not sure what tonight holds. We're dying for some sleep. I decided to try some periactin tonight, hoping that it will put a stop to some of this nausea. 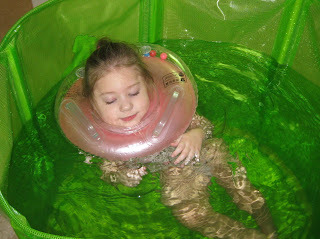 I haven't seen her this nauseous/throw-uppy since she was in the hospital (before the gj-tube). Hopefully it will help her sleep as well. How can you sleep if you're throwing up? Horrible. Not sure if I should try some more clonidine. We'll see how things go. Please keep her in your prayers. Reagan's mood has been much improved today. It's certainly not because she got a good night's sleep last night...she woke up around 4am and I had to calm her down before she would even think about laying in bed with us. She laid in our bed awake for quite sometime but eventually she did fall back to sleep, not for long, but at least she got some additional sleep. She hasn't really been fussy at all today. We even got quite a few laughs out of her. She's still not feeling well though. I drained lots of liquid from her tummy (obviously the same stuff she's throwing up). Despite all my efforts to drain the fluid, she still had a big throw up tonight. She was laying on her back and started choking...really freaks me out. She's pretty good about coughing it up, but it still makes me nervous. Aspiration is always a big concern. She's been very spitty again today so I've had to keep a close eye on her all day to make sure she didn't choke. I saw a few more of the head twitches today. She's also had a lot of chorea...I think it's all interrelated. Hopefully it will all resolve soon. Please keep her in your prayers. We need her healthy again! This has been one heck of a day...definitely not in a good way. Reagan had a horrible time sleeping last night. We put her down late but she was back up by midnight crying. I held her for a while (she was sleepy but kept startling herself back awake)...eventually she fell asleep in my arms. She woke back up around 5:30am and was awake. Lots of chorea, hyperalert. I sat up with her for a while and watched some tv. She finally fell asleep but woke up the second I tried to lay her down. In sheer desperation I put her in our bed and we tried to sleep with her whining beside us (she never fell back to sleep). Finally around 7am I gave up and just got up with her. She was very whiny most of the morning, but the crying kicked in full force this afternoon. 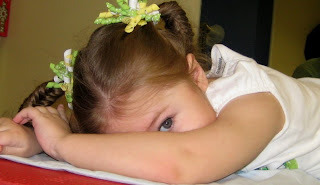 I've seen some head twitches again...the first that I've seen since her two EEGs. After she had the EEGs the twitches tapered off and then before we knew it, they were gone. Now that she's not feeling well, they are rearing their ugly heads once again. She's been very spitty which I think contributed to the two large throw-ups she had tonight. Poor thing...she's really nauseous and feeling lousy. Her cheeks have been hot and red, her hands and feet wet and clammy, something's definitely up. She's super miserable and beyond exhausted (but just can't fall asleep). I wish we knew the lab results from last week, maybe they could tell us something. Please say some extra prayers for her...she really needs them. Reagan has been a handful today. She must have woken up on the wrong side of her new bed! She's been fussy and/or crying all day long. She seemed to be OK when she first woke up...she was a little groggy though. Then she fell back asleep for about 20min and that was it...she's been crying ever since. She's had a lot of gas and had a dirty diaper, so maybe that's part of it, but I don't think that's all of it. She slept almost the entire day yesterday, she's very tense, she's got super clammy hands and feet, her eyes are very sensitive to the light again, and she threw up tonight (for the first time in a while). Something's up. We went in this morning and had her labs drawn to check her ammonia levels since she's been sleeping so much, but they only ordered ammonia and a basic metabolic panel, which won't really give any information as to what she's fighting right now. Not a good day. I just hope she's able to settle down and sleep tonight because after that last mishap with the trazodone, it's not really an option anymore. We need to talk to the neurologist about that...right now we don't have anything we can give her to help her sleep. This child is completely resistant to most medications...whether it be sleep, pain, nausea, or seizure medications. It's crazy. She needs her sleep. Please keep her in your prayers. She's had a bad day. 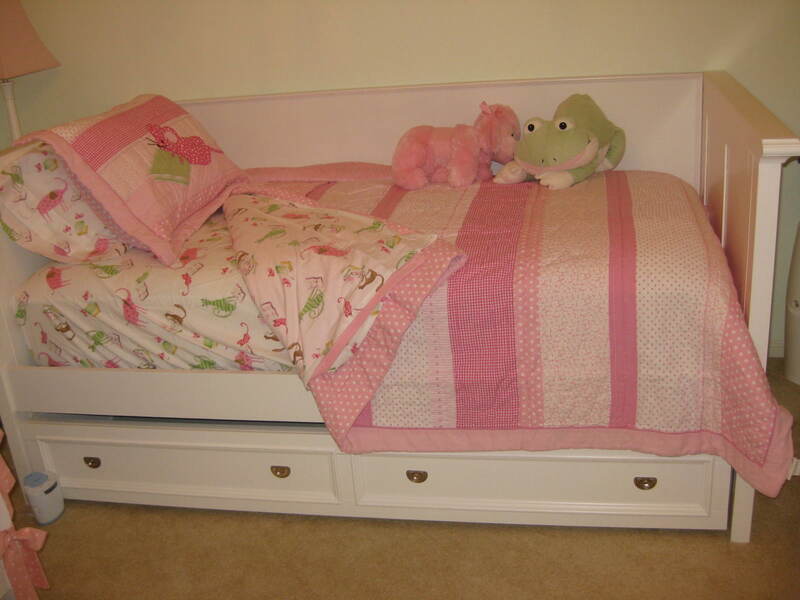 Her new bed (minus the ugly baby rail). 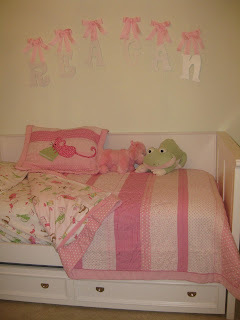 Reagan slept well again last night and woke happy again this morning. It's so nice to see her wake up happy...usually we wake to cries. She's been in a super mellow mood today. Very sweet and smiley but quiet. A little dazed or zoned out at times. Not sure if she's tired or just feeling "droopy". She seems happy though, so that's good. They delivered her bed today. There were a few issues...they put the back of it on backwards (which they came back and fixed) but there's also about an inch gap between the trundle and the bed which they couldn't fix (they're supposed to send out a "technician" in a week to look at it). The plan is to keep her in the crib for tonight and then tomorrow get her bed made up and ready to sleep in. I promise to post some pictures. Today Mike and I played in his company golf tournament. Reagan's nurse came in late and stayed late so that I could get away. I didn't have to go far, they had it at the golf course in our neighborhood so that was convenient. It was beyond hot and humid and miserable at times. We didn't do so well. I think I used up all my good shots the last time I played. Poor Mike, he always ends up having to carry his entire team. Thankfully Reagan was an angel the whole time we were gone and she's been an angel ever since. We're all exhausted so I sure hope she sleeps well tonight. So Reagan appeared to sleep last night. I say that because we slept and we never heard her, but she woke up this morning very groggy. Eyes red, she could barely keep them open...she took a nap only a couple hours after waking up and she's been slightly groggy all day! I'm guessing she didn't get as much sleep as we had originally thought. 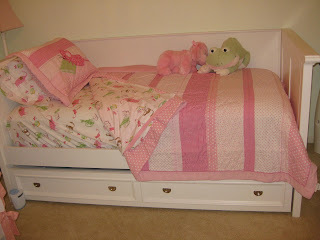 Maybe she'll sleep better in her big girl bed (thanks to Grandma). They're supposed to deliver it Wednesday. Her new mattress is actually more comfortable than our mattress! She'll be kicking us out of her bed! Reagan has been in a pretty good mood today. She was sleeping this morning when she was supposed to have therapy, so that was a no go. 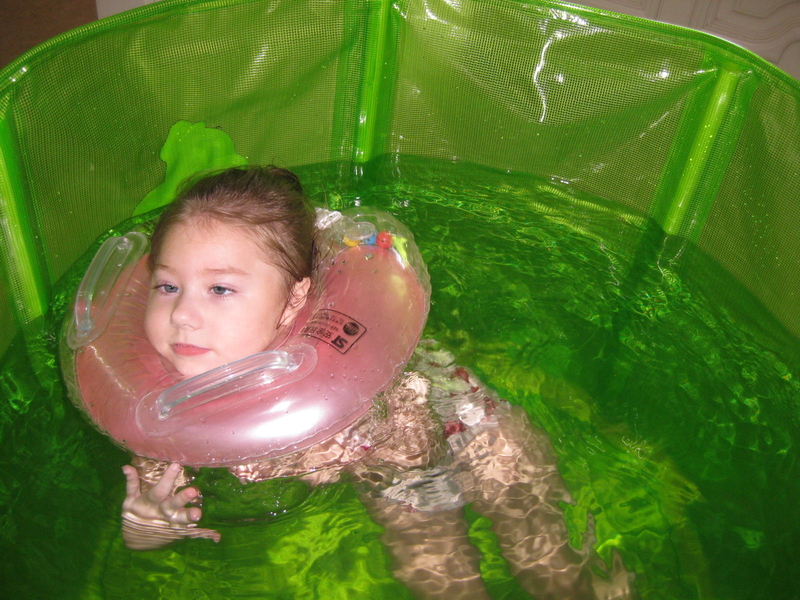 But this afternoon she spent a good hour in her stander without the slightest fuss. She's also been very talkative. It's so cute. I just have to get her on video doing it. She's still not back to her happy, healthy self yet. Her eyes were very sensitive most of the day, she kept them half cracked most of the time. She continues to struggle with congestion in her nose. Not sure if it's allergies or something else. It sure would be nice to have her 100% healthy again. Please keep this in your prayers. Reagan slept through last night, slept through til 1am that is. We tried her in our bed and she actually slept for a while, then she was awake and wouldn't go back to sleep. I got up with her and eventually she did fall back to sleep. I put her in her bed and then I passed out in mine. This constant interruption of sleep is so exhausting. Then to top it all off, today was a very fussy day for Reagan. She was super high maintenance. Lots of mouth movements but not necessarily gaggy. For the first half of the day she did a lot of whining, but then the second half of the day was filled with tears. I suspected tummy problems she hadn't pooped in 5 days. So I gave her a dose of the Fletchers laxative and we waited. It did work, she started pushing, but she couldn't get anything out without my help. It was a very painful process. Times like these make me actually miss the watery Miralax poops. Poor thing. She eventually cried herself to sleep. Then she woke up happy but that didn't last long, there were more poops to get out. I hope she's finally done. I don't think I'll let her go this long again without going. Next time we'll try the Fletchers after only a couple days. We don't need to deal with this again. She did seem to feel better in the bathtub, unfortunately we couldn't leave her in the bathtub all night and she started crying as soon as we took her out. Ugh. You just can't win. Well maybe all the crying will tire her out and she'll actually sleep tonight. That would be wonderful. Please keep her in your prayers, we so need a good day tomorrow! I don't know what we're going to do with this girl. Last night Reagan was back to no sleep again. At midnight she was still wide awake so I gave her the higher dose of the trazodone that her neurologist recommended last week. I was exhausted so I went to bed and Mike stayed up with her waiting for her to fall asleep. Mike said she had a weird response to the medication. She seemed to be having breathing problems and she'd kind of gasp for breath. I didn't hear about this til morning but I think from now on we'll stay away from that medication. That's scary! Mike was up til almost 4am with Reagan and she never fell asleep...finally he just laid her in her bed. Then I heard her coughing around 5am, I jumped up and rolled her on her side and she threw up. Poor thing. I got up with her and held her and about 45 min later she fell asleep. And she slept. And slept. She woke up a few times but always fell back to sleep. I felt bad for our nurse, who's only here one Saturday a month and Reagan slept most of the day! She finally woke up around 1:45pm. She was still very gaggy. She was only up a couple of hours when she started looking groggy again. Next thing we know, she's back asleep. And that's what she continues to do. I'm hoping she'll just sleep through the night and wake up feeling better. We have GOT to get her healthy and back to a regular sleeping schedule! Please say some extra prayers for her! Reagan finally slept last night! As the night wore on you could just tell, she was exhausted. She was having a very hard time falling asleep, she'd doze off and then wake seconds later with a big startle. I put her to bed and eventually she settled down and slept. I was pooped too so I fell asleep immediately. I was not at all pleased when I woke an hour or so later to her screaming. I didn't pick her up and eventually she settled down and fell back to sleep. She slept through til about 8:30am. She does not wake happy though, every morning starts off in tears but thankfully she recovers and still manages to have a good day. Our favorite nurse was back today but she was bearing bad news. She's moving back home to Oklahoma! Not until August, but still. I don't know what I'll do without her. I'm heartbroken. Meanwhile the nursing agency has been worthless and hasn't even attempted to find a Tues/Thurs nurse, so we may end up looking for a new agency. Anyway, while she was here I took advantage of it and finally ran the errands I've been putting off all week. It is SO hot and humid in the Houston area right now, it's miserable. Why anyone lives here, I don't know. Reagan has been a bit crazy today. Lots of chorea type outbursts. She's been content most of the day but she's had her moments where she cries out and gets fussy for no apparent reason. Hopefully she'll sleep again tonight. We need to play catch up...I'm exhausted. Please continue to keep her in your prayers! Reagan didn't sleep last night either. She was up the entire night moving around in her bed. We tried her in our bed for a short while but no luck. I could hear her in her bed coughing occasionally and all gurgly in her throat, finally I just picked her up and sat with her for a while. She's very spitty and she's holding it in her mouth and not swallowing it. Problem is, it doesn't get better even when you pick her up. I laid her back down around 6am and by 7am she was asleep. She only slept a few hours waking up for the day at 9:45am and she's been up ever since. What's amazing, even going on next to no sleep, she's really been a sweet, happy girl. I debated taking her in to the pediatrician because she does sound so junky but really didn't want to expose her to the germs in the pediatrician's office. The nurse we had today listened to Reagan's lungs and said they sound clear...it's all in her mouth/throat. I spoke to the pediatrician's nurse and she talked it over with the doctor and they both agree that it's probably just a head cold (which is what they are seeing right now) and that she's going to have to just work her way through it. Great. Work her way through it. I did take her in to feeding therapy today and her therapist worked with her trying to get her to clear the junk in her throat. Not much luck. I spoke to her neurologist today about her not sleeping at night (even when I give her 1/2 pill trazodone) and he said we could give her a whole pill (50mg). So we'll see. I'm going to wait and see if she falls asleep on her own but if not, we are going to give it a try. She really needs some sleep so she can get over this bug. Please keep her in your prayers. Reagan was such a turkey last night. She laid in her bed and refused to go to sleep! I got up at 1am and gave her 1/2 pill of trazodone. It didn't do a thing. I kept waking up every so often to check the monitor and each time there she was wide awake. Finally around 4:30am I put her in bed with us...it wasn't until Daddy cuddled her that she finally fell asleep around 5am. I was afraid she was going to wake up when Mike kept hitting the snooze...but she didn't. She actually slept til almost noon (at least someone got some sleep)! She woke up not so happy but got over it pretty quickly. She's actually been good all day. Other than some clammy hands and feet and the sleep issues, she seems to be feeling better. Lots of rolling again today. I say rolling but she really only gets onto her side...that's why she pivots in a circle. Below is a pic of the dog staring her down. Definitely jealous. He's pushing his luck (and he knows it) laying on the edge of Reagan's blanket. Reagan struggled last night in the sleep department. I woke a few times and saw her laying in bed wide awake. I have no clue how much sleep she actually got. When I went to pick her up she was all giggles. Unfortunately something about going from laying down all night to being upright tends to trigger her nausea and she threw up first thing. Poor girl. I hate that she has to wake up to that. She was a happy camper nonetheless. No nurse today. They haven't found a steady Tues/Thurs nurse yet so we've just had people filling in, apparently no one wanted to work the day after Memorial Day, so we were nurseless. Mike took off this morning to accompany us to an appt with the mitochondrial doctor. It was a pretty pointless visit. She basically just said that everything looks fine. Reagan's MRI didn't show anything that would point to a specific mitochondrial disorder and neither did her genetic testing. So still no answers. No clue on inheritance and it may be another year or two before it's even worth testing again (you have to wait for new tests to become available). Our best bet is to get the geneticist over at TCH to include Reagan in his study...and he was hesitant to make any guarantees. 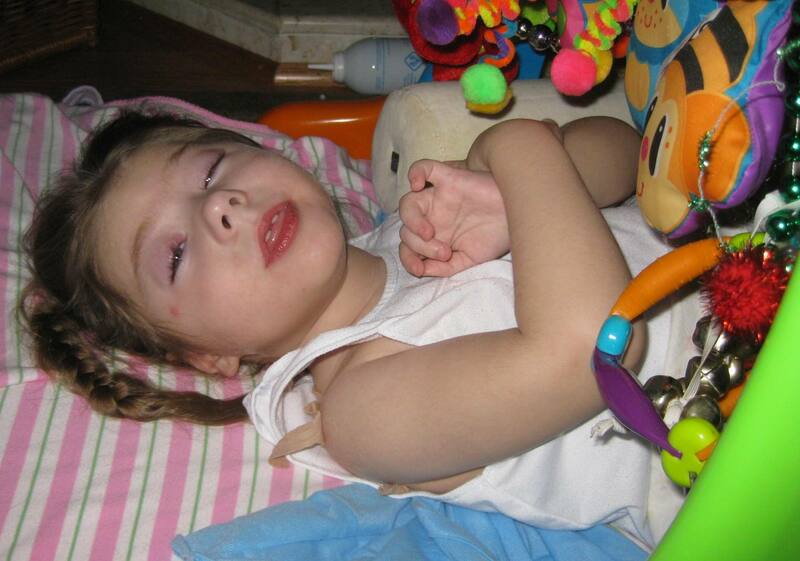 The mito doc did mention that Reagan's ammonia levels were borderline high the last time they checked. 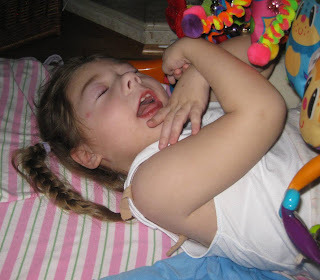 She said that high ammonia can cause irritability and developmental delay. And really high levels can make someone sleep...nonstop (kind of like what Reagan does every now and then when she sleeps for an entire day). So we had her blood drawn today and then next time she's super sleepy like that, we'll take her in and get it checked again. If they find that she has consistently high ammonia levels, they will put her on a daily dose of a vitamin, L-arginine. Reagan was so funny, she giggled nonstop during the appt, the doctor could barely talk over her! For the blood draw she was a pro, didn't even wince when she was stuck. 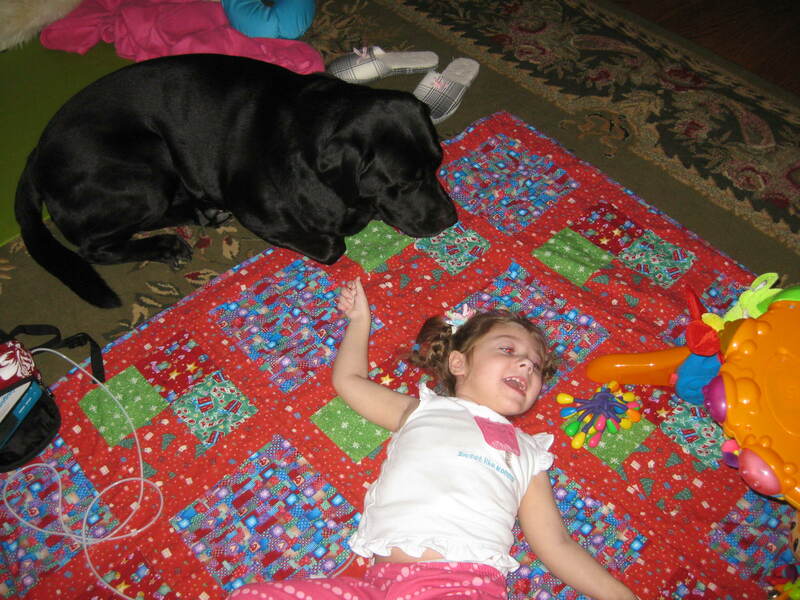 When we got home she was tired and took a nap, sleeping through vision therapy. She woke in time for her PT and did a great job. She wasn't as rolly polly today...although this morning she did roll the other way for the first time. During therapy she held her head really well, that is until we put her in the stander, then she just kept leaning her head forward. We're still waiting on the new stander. No word on whether or not it's even been approved. It's ridiculous that it takes so much time. 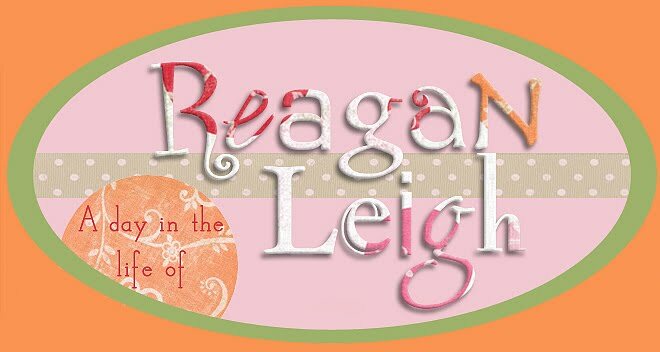 Please continue to keep Reagan in your prayers...she needs some sleep to get over this bug she's fighting!